by Percy Keese Fitzhugh. Edited by Karen L. Black. 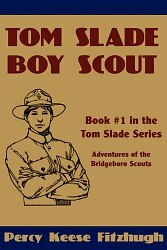 The Tom Slade series inroduces a forgotten gem of American fiction, the Bridgboro Boy Scout novels by Percy Keese Fitzhugh. Introduced in 1915 when the Boy Scout movement was new, the books glow with the freshness of the movement and the optimism of an age when everything seemed possible. In addition to Tom Slade, the series and introduces a number of beloved characters, including Pee-wee Harris, Roy Blakeley, and Westy Martin, each of whom later goes on to have his own series of books. Keese’s main characters are based on real people, giving the books an authenticity unusual in juvenile fiction (or any fiction). The self-reliant boys are reminiscent of the heroes in Robert A. Heinlein’s early fiction (not surprising because both authors’ work was serialized in “Boys Life”). See Bridgeboro.com for more information on Fitzhugh and his works. Also the Percy Keese Fitzhugh entry on Wikipedia. Because the Tom Slade books are nearly 100 years old, some parts of them can be hard for today’s readers to understand, due to shifting cultural references and the heavy use of dialect common at the time. The Norton Creek Press edition clarifies and annotates the books where necessary, making them as enjoyable to today’s reader as they were to the generation they were written for. Norton Creek Press. December 2008, 156 pages. Suggested retail price, $15.99. ISBN 0981928404. Young Tom Slade is a latter-day Huck Finn, always in trouble. Everyone expects him to grow up to be as worthless as his father. Connover Bennett is a latter-day Little Lord Fauntleroy, whose sheltered upbringing leaves him without skills or sense. What will it take to make something out of this unpromising material? A miracle not being available, the task falls to the Bridgeboro Scouts. Tom Slade, Boy Scout not only introduces Tom Slade, but also the rest of Fitzhugh’s famous scout characters — Pee-wee Harris, Roy Blakeley, and Westy Martin. You can read the first six chapters online. Norton Creek Press. December 2008, 156 pages. Suggested retail price, $14.99. ISBN 0981928412. Tom Does it the Hard Way. Instead of doing the sensible thing and taking the train to faraway Temple Camp, Tom Slade decides to get there on his own, first by canoe and then on foot. Accompanied by fellow scouts Roy Blakeley and Pee-wee Harris, Tom braves fire, flood, mystery, an escaped convict, possible murder-and even faces down a lawyer. First published in 1917, this book is a classic boys’ adventure by Percy Keese Fitzhugh, and has delighted generations of readers. It is imbued with the can-do spirit of the time, when nothing seemed impossible (and nothing was impossible) to a boy with stalwart friends and the courage of his convictions. Coming Soon: The Rest of the Tom Slade Series! This is just the first volume of a spectacular 19-volume series, which we intend to publish in full. Tom Slade, Boy Scout, 1915. Tom Slade on the River, 1917. Tom Slade with the Colors, 1918. Tom Slade on a Transport, 1918. Tom Slade with the Boys over There, 1918. Tom Slade, Motorcycle Dispatch Bearer, 1918. Tom Slade with the Flying Corps, 1919. Tom Slade at Black Lake, 1921. Tom Slade on Mystery Trail, 1921. Tom Slade’s Double Dare, 1922. Tom Slade on Overlook Mountain, 1923. Tom Slade Picks a Winner, 1924. Tom Slade at Bear Mountain, 1925. Tom Slade, Forest Ranger, 1926. Tom Slade in the North Woods, 1927. Tom Slade at Shadow Isle, 1928. Tom Slade in the Haunted Cavern, 1929. Tom Slade: Four Series in One from The Three Investigators. 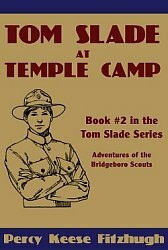 You can buy Tom Slade, Boy Scout and Tom Slade at Temple Camp on Amazon, or see our How to Order page for more options.